Welcome to Day #2 of Chocolate and Seeds Theme Week. 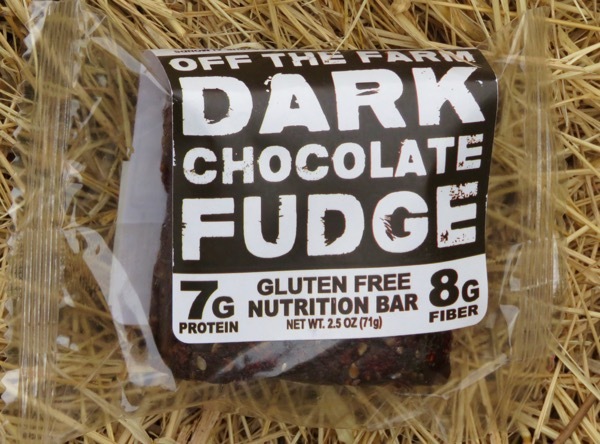 Today's Chocolate Fudge bar was from Off the Farm (Palo Cedro, CA), a company created by a group of family and friends interested in producing a line of healthy bars and offerings that would be good for the planet. This nutrition bar was packed with fruit (dates and apples), nuts (almonds and cashews), and four different kinds of seeds: sesame, pumpkin, sunflower and chia. 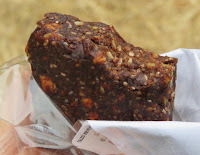 The dark chocolate in this gluten free, vegan and Non-GMO bar came from chocolate chunks and cocoa powder; and slightly chewy fudge bar contained 7 grams of protein and 8 grams of fiber.